For use on patients who have undergone surgery or repeated operations for pathologies in the abdominal area, who have gastro-intestinal fistulae of high or medium nature, which are a consequence of anastomotic dehiscences or other lesions. The SIM Duodenal Drain is a negative pressure suction drainage system which is used in contrast to past methods when it was often necessary to undergo surgery straightaway. 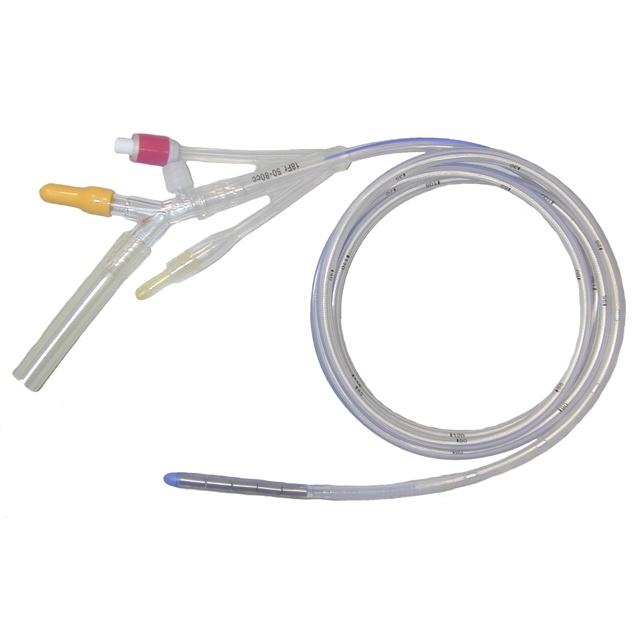 The SIM Duodenal Drain tube was designed to be used on patients that present an anastomotic dehiscence, whether it be a case of spontaneous closure or if it requires further surgery (application via gastroscope), or for protection of evaluated anastomosis, during the operation, of high risk for dehiscence (for application during the operation). In both cases, the tube is positioned by progressively introducing it into the gastro-intestinal tract until reaching beyond the Vater papilla, between the third and fourth duodenal portions. Once there, the distal balloon is inflated with 80 ml. of water (a regulated procedure according to the patient’s response). It is recommended to deflate this balloon every 48 hours, turning it and re-inflating it after a few minutes to avoid decubitus ulcers. The tube was designed to be connected to a low pressure suction source. Among the notable qualities of this device is the capacity to almost completely totalise bile externally, creating first of all a clean area in which the physiological processes of closure of the dehiscence are favourable, and secondly, generating an environment where the best conditions are created, in the event that a surgical operation is necessary. Given the reduced proportions of the aeration line, it is necessary, depending on the needs, to inflate from the outside. The tolerance of the SIM Duodenal Drain on the part of the patients is normally optimum, with the initial discomfort determined by the inflation of the balloon which can be easily overcome by progressive inflation until the normal value is reached. The device is designed to normally be left in place not beyond 30 days.